(1940, Monogram) Boris Karloff, Maris Wrixon, Henry Hall. 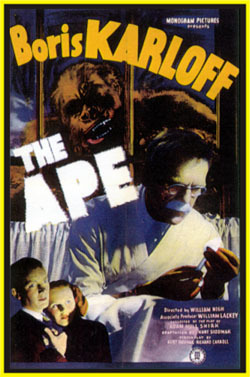 Boris plays a mad scientist roaming around the countryside in an ape suit killing people for their spinal fluid. A very unusual and rural type of feel and setting give this little Monogram horror film an extra boost. Nice 16mm original. Upgraded 6-95.